It’s been over a month since finishing it, but I gave it to my little sister only recently. When she unwrapped her cardi she cheekily exclaimed ‘about time!’, as she’s been asking (in the form of whinging) for a jumper or cardigan from me for a while. As soon as it was unwrapped, she put it straight on and seemed pretty happy with it. Lucky for her. 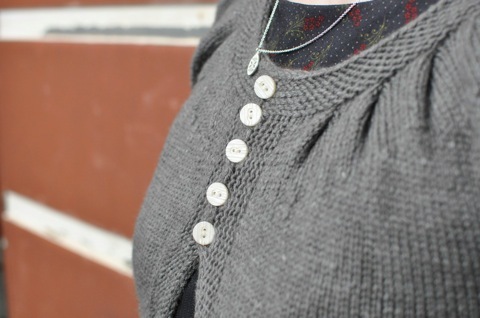 The best part of this pattern is the little details; the icord cast on and bind off, the pleats and the sweet icord buttonholes give the cardigan polish. 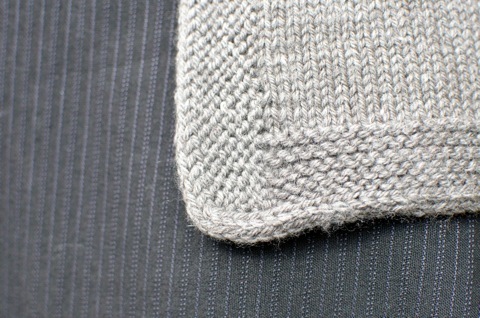 It’s those details that made the acres of stockinette stitch worth it. There were only three minor modifications that I made to the pattern. The first two were to lengthen the body and sleeves, based on the measurements on a cardigan my sister often wears. The other modification was to mirror half of the pleats, which I did after seeing a few versions on Ravelry with that modification. The cardigan just seems to look more balanced in comparison with the having all the pleats facing the same way. It was lucky that the size I made had an even number of pleats, because I’m not sure how I would have dealt with mirroring an odd number of pleats. After the little yarn hiccup at the start of the project, it was a joy to work with. Lovely and soft, a few lighter nubs for variation and the fabric had a lovely halo. It looks like I might be able to make something small for myself with the leftovers, but that does little to deal with the nagging feeling that I’ll never be able to get that yarn for such a good deal again. Even though I’m calling it finished it’s not really. When I gave it to my sister, I mentioned that she could have pockets on it if she wanted. Her response was ‘I like pockets’ which more or less translates to ‘I would really like it if you added pockets to this cardigan, dear sister’. Pockets she will have, but only after I manage to get the cardigan from her. I predict it will be officially finished in July 2023. Great job,nice to see it all done! Any way to knit the pockets and just sew them on when you next see her? Oh it’s gorgeous! Lucky sister!